Decision making scenarios tell a story (often in the form of a narrative, case study or history) and challenge students to draw from their knowledge and make decisions to advance the story and solve a problem. An interactive, multimedia learning object, for example, produced by Lippincott, introduces students to the pathophysiology of cells and then requires them to make decisions related to the case studies of sick patients. Decision making scenarios are a natural for health-related disciplines, but they can be used in any discipline where foundational knowledge is needed to make educated decisions. Busy instructors may be hard-pressed to devote the time required to design case studies and scenarios and yet this strategy will improve instructor designed courses and tremendously benefit students. In short, it takes time, but it is well worth it. In their TEC-Variety eBook, Curtis Bonk and Elaine Khoo describe 100 effective activities for motivating and retaining learners online. Activity 51 describes Multimedia case vignettes and decision making. Writing decision making scenarios may seem daunting. The challenge, however, lies on the creative side and not the technical. Only a few years ago, decision making or branching required some technical expertise; today, this strategy is within reach of all online learning instructors. eLearning authoring and/or web content authoring tools make building these scenarios relatively easy. That still leaves the creative side. Several years ago, I ran a search for examples that were not created by a publisher, but by instructors. I started with Merlot.org (http://www.merlot.org) and came upon Crisis at Fort Sumter (http://www.tulane.edu/~sumter/). This activity excited my imagination and I have been citing it as a best practice example ever since. The outward appearance of Crisis at Fort Sumter may seem a little dated by today’s web design standards, but don’t let that fool you. The content is thoroughly engaging. I’ll examine what makes this decision making scenario so compelling. I’ll also discuss general principles of design, and how an instructor could use a tool like LodeStar to author his or her own decision making activity. Let’s start with a description of Crisis at Fort Sumter and then extract from it some critical elements. Crisis at Fort Sumter owes its existence to Dr. Richard Latner, professor of History at Tulane University. Dr. Latner is the content expert for both this and The Salem Witchcraft site, another interactive teaching and learning site. His teaching and research interests center on American social and political history. Crisis at Fort Sumter won the Merlot Classics Award and Editors’ Choice Award in 2004. The activity has been peer reviewed through the Merlot member organization and the review comments have been published. Crisis at Fort Sumter is a web site that engages students in reading background information for the period between Lincoln’s election and the battle of Fort Sumter a few months later. Dr. Latner used text, images, graphics and audio to establish a historical setting for the important decisions that occupied Lincoln in that pre-war period. Students read the materials and are confronted with some of the decision making that occupied Lincoln during the time. There are five critical decisions that contributed to the outcome of the crisis. To add to the realism of the scenario, students can seek the advice of Lincoln’s advisers and read excerpts from newspaper articles that were published at the time. The site is presented to students as a web of information with links that take them deeper into the content. The site includes an event calendar, a bibliography and other resources to support the students in their task. The design of the site will appeal to self-directed, active learners. It provides random access to information. Students are presented with a menu. They can access any time period they wish, in any order. This suits adult learners, who appreciate control over their own learning. Students can return to the menu from any point in the site. A calendar with hyperlinks enables students to investigate events on specific days. A calendar accompanies the links to four of the five problems. In general, authors of decision making scenarios carefully evaluate what information should be included and what should be excluded. A decision making scenario is a type of simulation. Simulations need just enough information to help students generate ideas and opinions. Too much information is extraneous and distracting. Crisis at For Sumter strikes a good balance. Its author was deliberate about what to leave in. That is one of the toughest decisions an instructor must make in crafting a scenario. In reading the background, students realize that American leaders weren’t polarized into pro-slave and abolitionist, but held many opinions in between. Before students make their first decision, enough of the story of the secessionist threat is told to engage them and give them important information. They learn about the election of Lincoln, the secession of seven states, and the states’ seizure of forts. As the secession crisis unfolded, Lincoln was presented with a number of suggestions for handling it. Some ideas were urged upon him personally. Others were offered in newspapers, letters, in Congress, or public meetings. Inevitably, this advice differed. In order to understand the choices Lincoln confronted, click on the figures on the screen. Each figure represents a different policy recommendation. Consider these various options, and the nature of the crisis faced by the Union, and ask yourself: If you were Lincoln, what would you do? And why would you choose this particular course of action? Students click on each historical figure (e.g. Horace Greeley) , read the advice and then write in a notepad what they would do. The notepad is simply a web form that posts the response to an email address. Then students are invited to read what Lincoln actually did. In other words, students are asked to reflect on what they wrote and compare that to Lincoln. Stepping away from Crisis at Fort Sumter, let’s consider some key design suggestions that apply to the construction of decision making scenarios. First, list to yourself the concepts, principles, procedures and rules that you want to reinforce. Organize your story according to key problems that need to be solved. Consider which elements of the story serve to engage students’ interest and engage them academically, related to #1 and exclude everything else. Keep it simple at first.Scenarios can progress from simple to complex, increasing the challenge to the learner. Game design encourages instructors to increase complexity, plateau for a while, then increase again. Offer, when possible, multiple paths to success, but avoid a combinatorial explosion of paths. Allow the students to compare their answers to that of the ‘expert’ and/or one another. To demonstrate how to build a decision making activity, I asked Dr. Latner’s permission to use some background information from Crisis at For Sumter as well as two problems and demonstrate how to build this type of activity. I want to emphasize that this is just a small subset of Dr. Latner’s work. Warning: The following information will be too detailed for authors who do not use LodeStar. Feel free to view the example and then skip to the conclusion. Because I am the author of LodeStar, I choose LodeStar to build out this example. 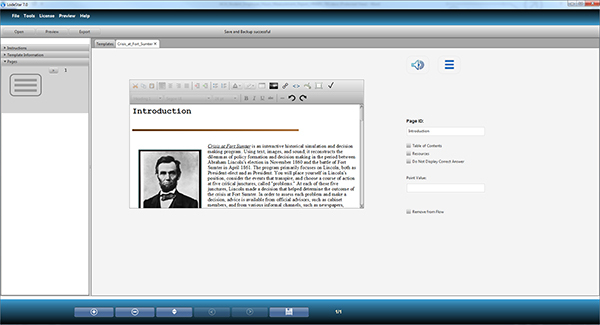 Instructors could use Captivate, ZebraZapps, Articulate StoryLine and other tools to build similar examples. The best template for building decision making scenarios is ActivityMaker. It is an all-purpose template. 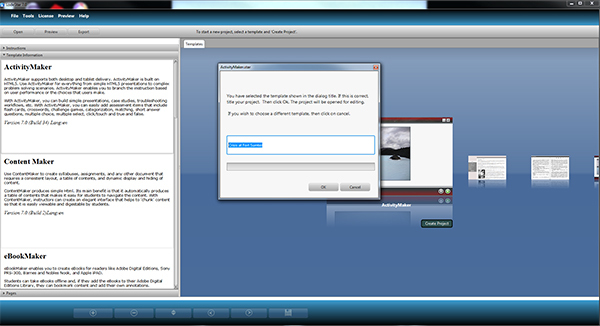 In the screenshot, I am selecting ActivityMaker template to create a project named Crisis at Fort Sumter. The default page type in the ActivityMaker template is the ‘Text’ page. Text pages support images, text and even audio. I simply copied and pasted Dr. Latner’s content into a text page but I could have keyed in my own original content. To add visual interest, I inserted an image of Lincoln from the Library of Congress. This was not part of the original content. I am also deviating from the original design. Dr. Latner starts off with a menu that branches off into different parts of the content. The menu is composed of a table of images, each linked to a different page. This is certainly creatable in our project, but to keep things simple, I fill in the Page ID and check off ‘Table of Contents’ on the right side of the page. LodeStar automatically generates a table of contents for me. Our choice of the type of table of contents is controlled by selecting Tools > Project Settings. The default is Dropdown. I will choose Menu Style 2. This gives me a fixed sidebar menu that hugs the left side of the screen. To add more content, I click on the ‘Add a Page’ button at the bottom of the screen. This is the button with the “+” label. Again, I filled in ‘Dilemmas of Compromise’ in the Page ID field and checked off ‘Table of Contents’ on the right side of the page. “Crisis at Fort Sumter” presents students with five problems. I will recreate only the first two problems. I have several options on how to present the problem. I choose to create a resource. A resource is a new concept to LodeStar. When authors, select the ‘Resources’ checkbox (beneath Table of Contents) they are creating a tab at the bottom of the page with a title that matches the Page ID. When students select the tab, the resource simply pops up in a separate dialog box. Students don’t lose their place. If they are on page two and access a resource, they will return to page two.Also new to LodeStar is the ability to link from one page to another. Just as LodeStar can link to external pages, hyperlinks can take students from one LodeStar page to another. I will demonstrate this option in another article. But LodeStar makes it easy to simply link to another page. Why did I not do that? The reason is that linking to a page causes the student to navigate to that page. Linking to a web resource causes the web resource to pop up on the screen and the student not to lose his or her place. Alternatively, I could have placed each of the advisers in its own resource so that at anytime in the activity students could consult an adviser by clicking on the resource tab at the bottom of the page. That would have worked fine. A resource can be anything that can be displayed on a web page. It could be an article, a chart, a statistical table…anything that can be displayed on a web page. In Crisis at Fort Sumter students are asked to submit a response to what they would do. 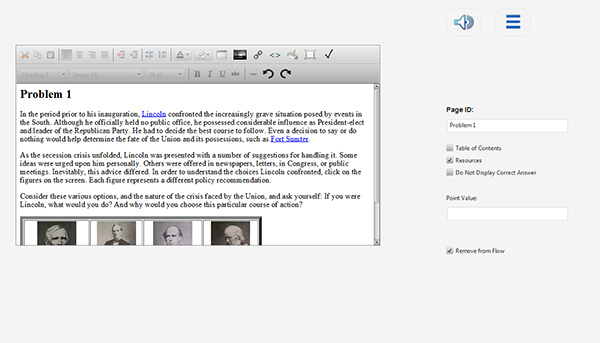 LodeStar supports this type of activity with the Long Answer page type. The long answer is where students type in their responses. The journal page, a different type of page, is used to aggregate all long answers and display them on a single page. LodeStar will send the student responses to a Learning Management System, but instructor access to these answers is, at best, cumbersome. This is likely to change in the future. In the meantime, encourage your students to copy the journal page into a Word document and submit to a drop box. LodeStar will also attempt to store student responses and retrieve them, but this is still an undependable feature. It is best to advise students to copy and paste their responses to a word document each and every session. I added another variation to the original activity. Rather than have students submit their journal response and then view what Lincoln did , I pose a question that must be answered in order to ‘unlock’ the description of what Lincoln did. This approach causes students to ‘own’ their answer or ‘commit’ before reading the response of the ‘expert’. There are several LodeStar features in play here. First, as mentioned, you can take any page out of the flow. That means that students will only be directed to what Lincoln did as a result of a branch. Each question option or distractor can be associated with its own branch. A branch is designated by this symbol. In other words, there is a range of options. In this example, I automatically branch to a page that displays what Lincoln did, after two seconds. At the risk of repeating myself, students will not see that page unless they answer the question because the page has been checked out of the flow. The decision making scenario is an extremely engaging and effective strategy. Some instructors, as described in Bonk and Khoo’s eBook, dedicate 40 to 60 hours per scenario. That may be too great a leap of faith for some. Instructors might want to consider smaller and simpler scenarios to start. If students can directly relate time spent on scenarios to improved test scores, they will make the time. Improved test scores will make it easier for instructors to justify their effort. The real benefit, however, is that decision making scenarios help prepare students for the ‘real world’. Students should be inferring, analyzing, reasoning and evaluating in preparation for the world beyond the classroom. Scenarios are one strategy that instructors can use to make online courses compelling and, more importantly, effective. That beats dull and deadly every time. Bonk, C., & Khoo, E. (n.d.). Adding some TEC-VARIETY: 100 activities for motivating and retaining learners online. Crisis at Fort Sumter. (n.d.). Department of History, Tulane University.